The Galapagos Islands are a small archipelago in the Pacific Ocean about 600 miles west of Ecuador. With a treasure trove of unusual native species not found anywhere else in the world, the islands are fascinating and delightful for both scientists and tourists. Made famous by Charles Darwin’s observations while voyaging aboard the Beagle, the exotic animals are abundant, so you don’t have to worry about spotting them. In the course of a normal day, you may find hundreds of marine iguanas gathering together on the beach, or sea lions warming themselves poolside at your hotel. Just a few years ago, there was no way to fly to Galapagos with miles. It was possible to get an award seat to the Ecuadorian cities of Quito or Guayaquil, but the short flight to the islands cost $400 to $500. Today, though, you can easily fly all the way to Galapagos with miles. Award availability to this remote archipelago is pretty good, too. Seymour Airport is the most popular airport for tourists, and it is located on Baltra Island. LAN Ecuador, a oneworld member, flies to Seymour Airport from Quito and Guayaquil. LAN flies direct to Guayaquil from New York, but it’s difficult to find award flights for the final leg from Guayaquil and Baltra. If you can find a seat, this is a good route to take. The easiest way to book a flight to Baltra with AAdvantage miles, though, is to fly on LAN via Miami and Quito. You will have to call because you can’t book LAN on American Airlines website. The $25 phone booking fee will be waived. During off-peak times for this route, which is much of the year, you can fly roundtrip to Galapagos for 30,000 miles instead of 35,000 miles. Off-peak dates include: January 16 to June 14, and September 7 to November 14. That’s a great deal, considering that flights to Galapagos can be $1,000 or more. LAN doesn’t offer first class. The only Star Alliance member that flies to Baltra is Avianca Ecuador. Unfortunately that carrier doesn’t fly to the U.S., so you’ll usually be routed through Panama City or San Salvador. As a result, those routes are at least three-segments long. Availability is typically excellent, though. First class is not available on this route. If you have difficulty finding an award ticket on LAN or Avianca from the U.S., you can fly Delta to Quito first, and then connect to one of those airlines. It costs more miles, so don’t take this route unless it’s your only option. Delta flies to Quito from Atlanta, with good award availability throughout the year. There is another airport in Galapagos on San Cristobal Island. Many of the same airlines fly there from Quito and Guayaquil, but it’s harder to find a reward ticket for that route. 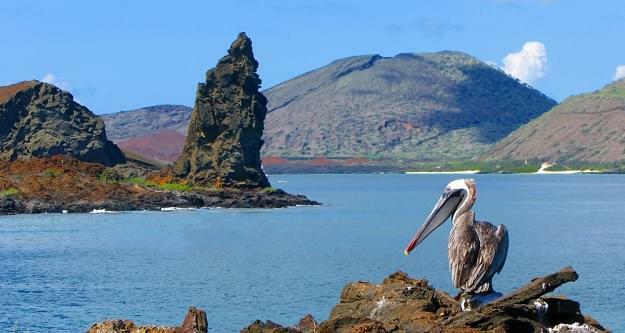 Besides, transportation to Santa Cruz Island, where most of the hotels in Galapagos are located and where most cruises originate, is much easier if you arrive at Seymour Airport on Baltra.